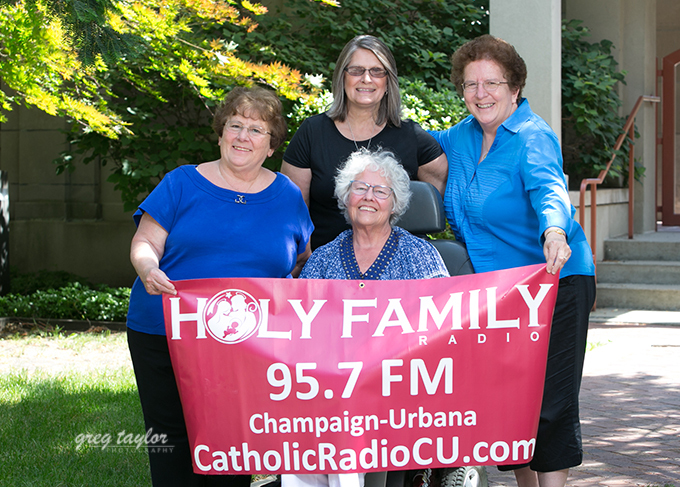 Holy Family Radio, 95.7 FM, Champaign/Urbana, Illinois, has operated an FM radio station since April 24, 2015 and broadcasts EWTN Catholic radio programs. Because our station is a low-power FM station, our listening area is basically the cities of Champaign and Urbana and very little outside of that. Thank you for listening - - God bless you. EWTN stands for the Eternal Word Television Network and has been broadcasting Catholic television and radio programming for over 35 years. Their programming includes basic Catholic teaching, masses, devotional prayers, special events, talk and much more. 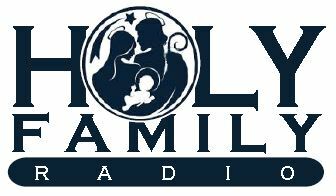 Please pray for Holy Family Radio that it might help spread the good news of Jesus Christ. Please ask your friends to listen to the Catholic teaching on WLHF-LP to help spread the good news of Jesus Christ. If you would like to display an attractive durable vinyl bumper sticker (pictured below), please call our studio line or send an email both listed below. Displaying a bumper sticker is an excellent way to quietly evangelize.